Lloyd's Lab, the global insurance market's new innovation sandbox, launches a global search for tech talent to partner with the Lloyd's market and develop solutions for its unique and rapidly changing needs, in a fast-track, fast-fail environment. For the first time in its 330-year history, Lloyd's is opening its doors to the global tech start-up and entrepreneur community, giving unparalleled access to the world's largest market for specialist insurance and reinsurance, in support of its digital evolution. The Lloyd's Lab global talent search, led by applied corporate innovation specialist L Marks, is looking for entrepreneurs, alongside early and growth stage companies operating in the InsurTech space worldwide. This tech talent will help deliver innovative solutions to some of the key challenges the Lloyd's market faces and make a real impact on the market's performance. Over ten weeks, selected start-ups will be given the unique opportunity to work with Lloyd's market experts to shape the next big innovation. 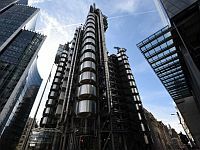 Start-ups will be given access to a state-of-the-art co-working space located in the Lloyd's building in London, potential funding and the chance to develop products, platforms and processes that will help transform Lloyd's into an increasingly technology-driven market. - creating smart insurance products. Lloyd's CEO Inga Beale said: "The Lloyd's Lab will contribute towards a more sustainable and competitive insurance market by providing a dynamic environment where start-ups can come in with different ways of thinking and fresh ideas. We want to challenge how we do things and we are looking for entrepreneurs that can help Lloyd's redefine how we use technology to better serve our customers in this hyperconnected world." Lloyd's Head of Innovation, Trevor Maynard, said: "We're looking for solutions that can create true commercial value for the Lloyd's market. Whether by reducing costs, helping make better underwriting decisions, making operations more efficient or improving the policyholder experience, we want to see ideas that make a real impact on market performance." Applications for the chance to win a place in the first cohort of the Lloyd's Lab close on 22 July 2018. The most compelling applications will be put forward to pitch to Lloyd's senior leadership and market representatives on 3 September, with the inaugural Lloyd's Lab cohort starting on 8 October. The Lloyd's Lab is a key strategic initiative, which complements a programme of innovation projects that are focused on driving improved market performance, and enhancing access to Lloyd's through technology. As announced in April, Lloyd's will launch a new digital coverholder matching portal pilot next month (July) across the UK, Australia and New Zealand. The online portal will seek to quickly and easily match new binder, or coverholder, business with Lloyd's underwriters, and will further enhance the market's ability to quickly, easily and cost effectively attract new business by accessing coverholders in both established and fast growth markets.